Some Gallifreyan words (3). I don't know if it's a true creation of Steven Moffat or.. just a shabiki who likes VERY MUCH Doctor Who, enough to create a whole new alphabet from another planet. :3. Wallpaper and background images in the Doctor Who club tagged: doctor who gallifreyan alphabet gallifrey timelords. Thanks for this. These are sweet! They would make awesome tattoos. They have some real complicated words. They took words from all the languages of the word and they made the Gallifrey alphabet.When you like sth mery much or you'ge passioned with one idea you do everything to make it better. 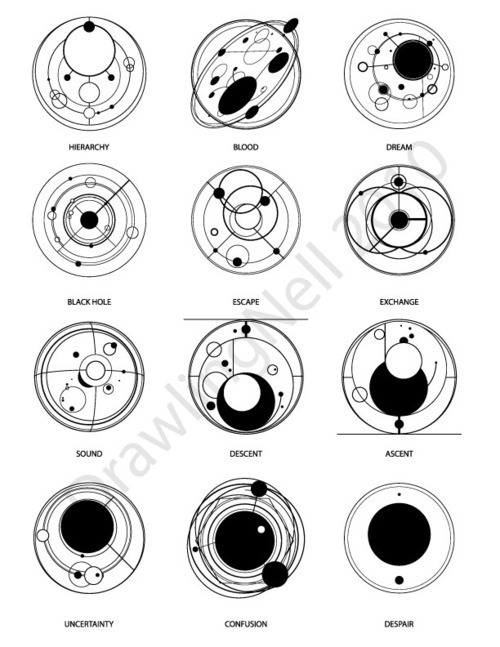 Looking through all three of these, I have a theory that Gallifreyan is meant to invoke thought and emotion from these patterns of circles. If you look at confusion, it looks like confusion. It looks dizzying and spinning as if you were completely dazed and confused. It's not just circles anymore, it's a feeling. Cool, huh? ^Now that you bring it up I can actually see that! !